Soul food, with a side of mayuketchu. Eric Rivera (left) and Christopher Caraballo. Hours: Tue.–Thu. 11:30 a.m.–8 p.m., Fri. 11:30 a.m.–9 p.m., Sat.–11:30–8, Sun. 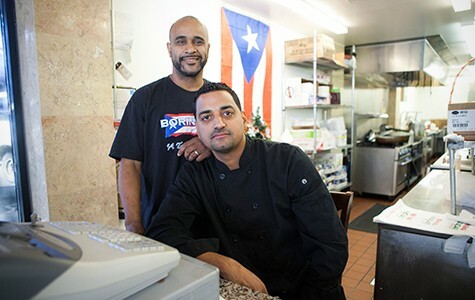 noon–6 p.m.
Every Latin cuisine has its own take on rice and beans, but few are as singular, or as delicious, as the arroz con gandules at Borinquen Soul, a Puerto Rican kitchen that has taken up permanent residence inside the Two Star Market convenience store in Oakland's Dimond district. Here, the rice is orange-red, as though stained with ketchup, and studded not with black or kidney beans, but with pigeon peas (the gandules), which you might mistake for plain old green peas — but have the starchiness and the satisfying al dente bite of a much sturdier dried legume. Mostly, though, what you'll notice is the smell of the rice — the heady mix of cooked onions, garlic, sweet peppers, cilantro (and its cousin, culantro), and other aromatics known as sofrito, which forms the base of almost all Puerto Rican cooking. That smell — along with the proliferation of Puerto Rican flags on every available wall and counter surface, and the lilting hook of the reggaeton number playing on the speakers — is the unmistakable signal to any homesick Boricua who walks in the door: Real-deal Puerto Rican food, like what your abuela used to make, now has a home in Oakland. Sandwiched between two hair salons, the Two Star Market is your run-of-the-mill convenience store — neat aisles well stocked with assorted junk food and brand-name booze — apart from the fact that it houses a fully equipped commercial kitchen. For a while, the takeout counter was known as The Snack Bar, a kind of stoners' paradise that specialized in late-night burgers and fried foods. In July, Borinquen Soul started serving its Puerto Rican dishes during the lunch shift, and, soon after, took over the convenience store's food operation altogether. 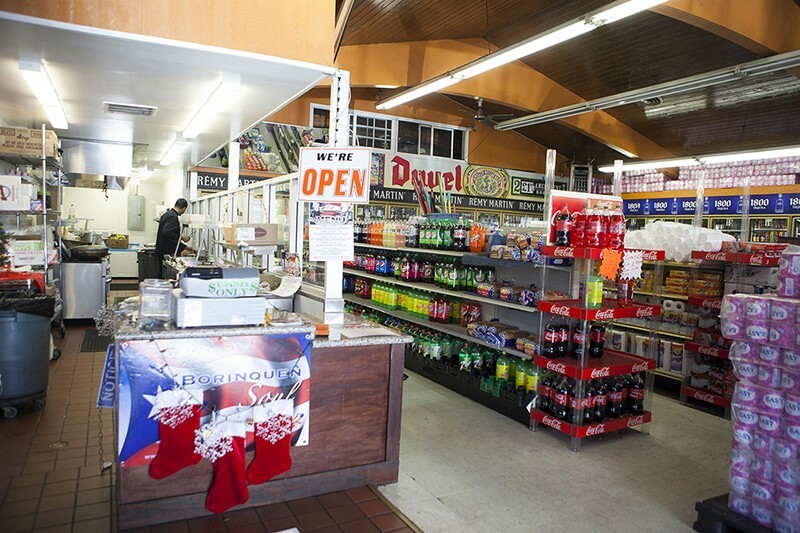 Borinquen Soul is housed inside the Two Star Market. According to co-owner Christopher Caraballo, Borinquen Soul is a scrappy "startup company" that he and fellow Bronx native Eric Rivera built up over the course of the past four years. The first incarnation was touted by its owners as the Bay Area's first and only Puerto Rican food truck. But a year ago, just as the business was making a name for itself on the local festival and food pod circuit, the truck was sideswiped by a hit-and-run driver. The company's insurance policy didn't pay out nearly enough for a new truck, and so for several months, before the Two Star Market opportunity came up, the future of Borinquen Soul was very much in question. Now, the business appears to have a steady stream of takeout customers, many of them Puerto Rican expats and transplanted East Coasters. The obvious reason is that for all intents and purposes, Borinquen Soul is the only full-fledged Puerto Rican restaurant, really, in the entire East Bay. The more important reason is that the food is damn good by any standard. Caraballo serves as head chef of the operation, but he said most of the credit belongs to his mother, Isabel Caraballo, whose recipes serve as the starting point for most of Borinquen Soul's dishes. This is Puerto Rican grandma food, literally. In fact, Caraballo said the name of the business — after the indigenous Taino people's name for the island of Puerto Rico, "Borinque" — is meant to represent their old-school, "old soul" cooking philosophy. In case you have any doubt: The rice alone is worth a special trip — so savory and aromatic, with that telltale orange tint that comes not from tomato sauce, as one might suspect, but from the annatto oil that's used to cook that sofrito paste, imbuing it with an extra layer of nutty complexity. 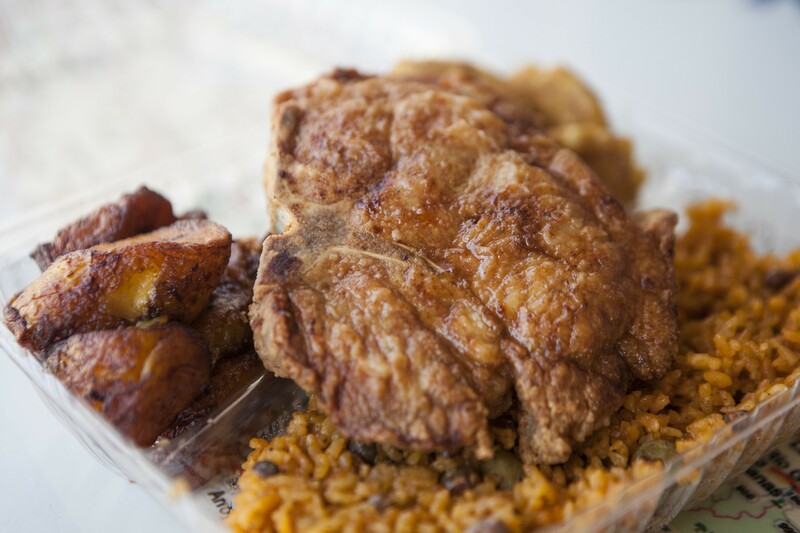 The arroz con gandules form the base for all of the four or five combo meals that make up a standard order on Borinquen Soul. In addition, you get the entrée of your choice, plus either plantains — either the impeccably ooey-gooey sweet maduros or crisp and savory twice-fried tostones, which are made from green plantains and are like a cross between a smashed potato and a yucca chip — or a salad. Caraballo and Rivera originally built their reputation on a dish of grilled chicken and caramelized onions, which I tried and enjoyed back in Borinquen Soul's food truck days — and am happy to report is better than ever, thanks to their decision to switch to chicken thighs instead of the breasts, which were prone to dryness. The meat comes topped with "Borinquen Soul Sauce," which is Caraballo's version of mayuketchu, Puerto Rico's default condiment, which is normally a straight-up mixture of mayonnaise and ketchup. The "soul sauce" turns the dial up on this otherwise basic condiment by adding a dash of chili spice and some of that house-made sofrito, which adds its earthy vegetal quality to the mix. Pork pastel, tostones, and arroz con gandules, with a side of the house mayuketchu. Whatever you order, ask for a couple extra tubs of this amped-up mayuketchu. It goes well with everything on the menu, but especially with the empanadillas (Puerto Rican-style fried empanadas) and the bacalaito, a pancake-like salt-cod fritter that I loved for its golden-brown exterior crunch and surprisingly mellow salted-fish flavor. 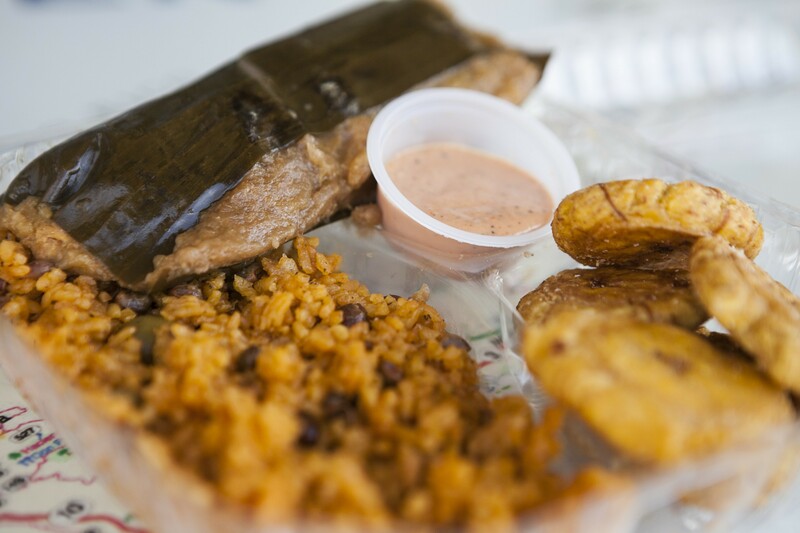 In a drastic departure from the food truck days, when vegetarians had to content themselves with a meal of plantains and, well, that's about it, Borinquen Soul is now, as Caraballo put it, 100-percent "California-friendly." Though they aren't listed explicitly on the menu, the restaurant now sells vegetarian empanadillas in addition to its more typical stewed-chicken and ground-beef options. And the house salad, with its tangy-sweet dressing and its enormous cubes of cucumber and avocado, speaks to the local farmers' market crowd as much as it does the tropics. Still, the restaurant — if you can call a convenience store without proper seating and just a few stools where takeout customers can wait for their orders a restaurant — reserves its greatest pleasures for meat lovers. On Saturdays only, there is pernil, a slow-roasted pork shoulder that's typically reserved for major holidays. Whole pork shoulders get marinated for 24 hours with garlic, peppercorns, and various aromatics, the fatty skin peeled back so that the flavors can penetrate the meat. The meat is roasted, first at a high heat to crisp the skin, then low and slow, until it is unspeakably tender and pulls apart like good Mexican carnitas, except saltier and more garlicky. The best part is how the pork is slicked with the concentrated meat juices, which are flavored with all the caramelized bits from the pan. Or, scratch that: The best part is the crispy skin — or cuero — which is reserved on the side, only given to customers who ask for it, which any seasoned pernil connoisseur knows to do. Borinquen Soul is also probably the only place in the Bay Area where you can buy scratch-made, freshly steamed pork pasteles — Puerto Rico's plantain-leaf-wrapped version of tamales and the island's quintessential Christmas dish — on a daily basis. This was easily the most interesting dish I had in my visits to Borinquen Soul. The masa for the pasteles is made not with corn but rather grated green plantain and yautia, a root vegetable similar to taro. Once you open the steamed bundle, you're struck by the masa's somewhat slimy texture and how extraordinarily fragrant it is. After steaming in that masa for an hour, the pork takes on a striking earthiness that reminded me of dried scallops, giving the whole package a flavor profile that I found strikingly similar to zhongzi (aka "Chinese tamales"). Coincidentally, it turns out that pasteles are delicious with sriracha — not a traditional condiment on the Puerto Rican holiday table, I'm sure. But here in Oakland, we're lucky: We can eat pasteles every day.